Boho Bridals in North Carolina. I love weddings. I also love to make choices where I can reduce my footprint on the environment. With these two things I love in mind, I decided it would be a really rad opportunity to blend them together in a bridal styled shoot inspire brides who may choose the eco-friendly and sustainable route for their weddings as well. P.s. being eco-friendly doesn't mean you lack being on-trend and fashionable, it just means you have to get a bit more creative in your planning! 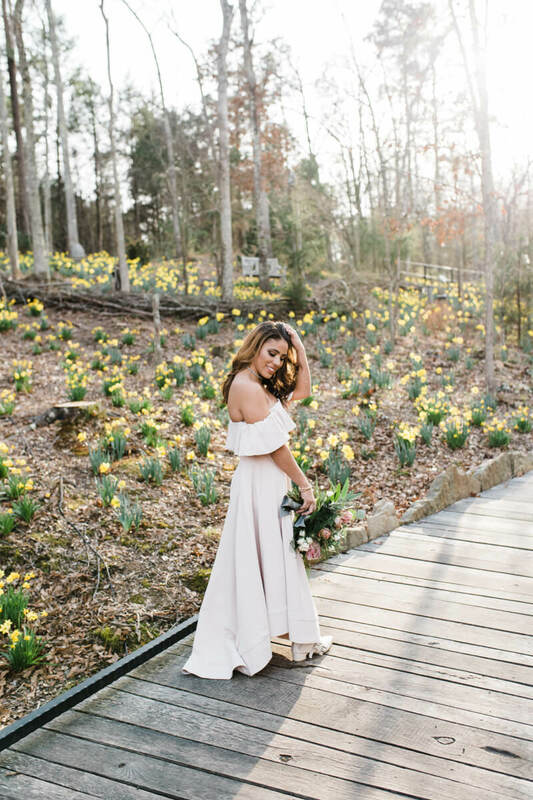 Part 2- With warmer weather around the corner, how could I not step into a gorgeous botanical garden to capture the perfect blush dress, gorgeous jewelry that gives back and a bouquet that screams, "SPRING IS HERE!" What I loved about this shoot is that it not only is eco-friendly, but it also supports local businesses. Also, you don't have to break the bank with your unique bridal style. Fashion & Compassion provided the jewelry. F&C is a nonprofit that provides women with jobs (locally and globally) that not only support their families, but also helps change their communities. The bouquet was designed by Wild Petal Studio, a Charlotte-based floral designer who chooses to source her flowers locally as much as possible, which continues to support other small businesses in the area. The gorgeous makeup was done by local makeup artist, Jesse Pellington, who also gives back to her community by working with band students. Our delightful model is working on inspiring other women in her generation to grow and become who they were made to be. My team was incredible, and I could not have put this together without them!